Without objection the minutes of the 11-22-11 regular meeting were approved. Without objection the bills were approved in the amount of $23,116.36. 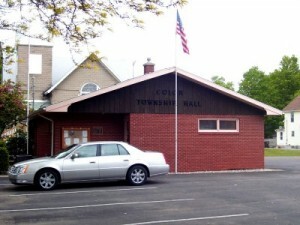 Colon Village Council had asked to be put on the agenda. Whitford (speaking on behalf of the village) stated he felt it was in the best interest to have this Colon Fire and Rescue agreement approved. The Village understood everything was to be prorated. They felt the $2600 would also be prorated. He urged the township to do the right thing and pay the $1300 for the partial year. He stated as a public official it is our duty to do what is in the best interest of the people. Mckelvey asked if anyone else from the village wished to speak. Bell stated we have issues that need to be resolved. Mckelvey asked if anyone else from the village wished to speak – no one responded. Attorney Thornton Report – there is a hearing on the Appleton case on 1-5-12 at 2:00 p.m. A compliance order is pending on Candace Smith. He asked that the zoning ordinance changes be put on the agenda for the next meeting. Fireboard Report was given by Dan Smigla. Jackson reported only 1 bid had been received on the land in Magic City Mobile Home Park. At this time we are not going to accept the bid. The budget amendments were tabled until the January 18, 2012 budget meeting. Motion by Smigla, second by Miller. Parlins gave us a bid on new carpeting; waiting on a bid from Bowersox. Supervisor McKelvey said she would check on the trimming of the shrubs. Cerny is to have new zoning ordinance books next week. Zimmerman understands the villages issues. He is disappointed so much time has went by without a decision and asked why. Thornton stated he sent Attorney Tomlinson an email on 11-7-11 that stated the townships position. Zimmerman felt we should put it to a vote and sign the contract. Smigla thinks enough money has been spent on fees and special meetings and this matter should be settled. Jackson stated that the Village minutes said, “The village council states that the township has spent in excess of $25,000 on legal fees.” Jackson stated no one has asked for any information via the FOIA and this statement is totally false. McKelvey stated that whoever said that at the village meeting gave them wrong information. McKelvey stated we could withdraw the $2600 then the $1300 issue would go away. Zimmerman made a motion to rescind the Township’s previous approval of the proposed contract, amend the proposed contract to provide that the Township will make a $1300 contribution for the large equipment fund for 2011-2012 in addition to $2600 contribution for each of the five years thereafter, and approve the amended proposed contract.. Second by Smigla. Under discussion Jackson said she would not have a problem voting yes if the village would share the cost of attorney fees for the drafting of the contract. Roll call vote – Zimmerman, Smigla – ayes; Miller, Jackson, McKelvey – nays. Motion failed. The budget workshop will be held on 1-18-12 at 10:00 a.m.
Motion to adjourn by Miller, second by Smigla. Meeting adjourned at 8:10 p.m. It seems like an awful lot of money would have been paid to the Township Attorney just to save $1300. What a waste of time and money! Maybe it’s time for those who commented on this issue come to the township meetings. Misinformation is worse than second hand information and you do not know all the facts/circumstances behind this. How often are Township meetings held? There have been no minutes posted since a meeting on 12/27/11. The Village posts their minutes on a regular basis. What is the Township board afraid of? The Township holds their regular meetings on the 4th Tuesday of the month at 7 pm at the Township Hall.